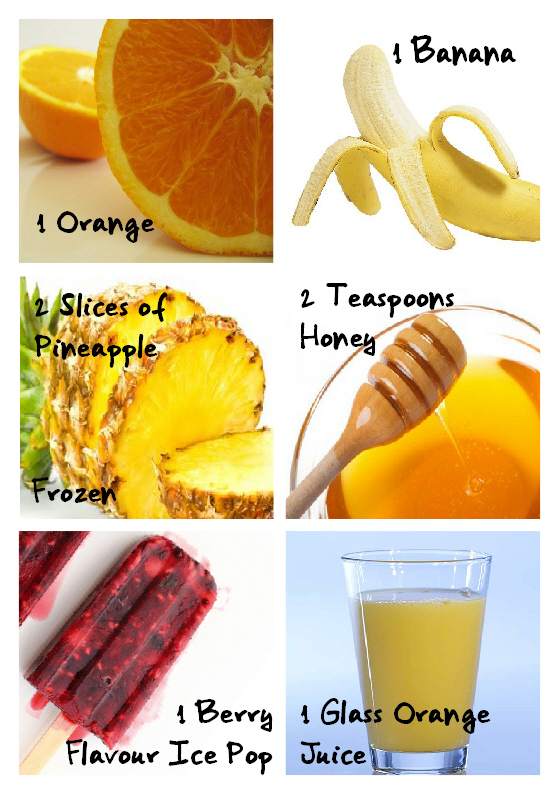 Credits: Orange, Banana, Pineapple, Honey, Ice Pop, Orange Juice. I put all of this into my blender and gave it a whoosh.I then split half the mixture into a pint glass and the rest into a storage jar for next time. I topped my glass up with orange juice to make it less gloopy and enjoyed a mid afternoon pick me up on the miserable grey day that is soo common in the UK.Give it a whirl and see what you think… PS check out the links for the Banana to find lots of facts you never knew about bananas and the Ice Pop link for a brilliant berry and mint recipe. YUUUM!!! this is just want i feel like right now!!!! !